At age six the sharp bite of a whip taught Harriet Tubman (1820-1913) what it meant to be a slave. The other slaves scoffed when Harriet resolved to escape north someday. Little did they know that this girl would one day lead hundreds of slaves to freedom on the Underground Railroad. 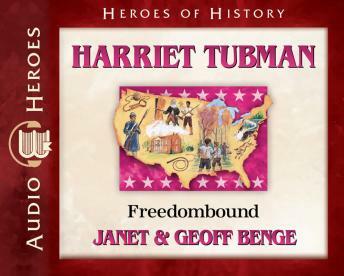 Even huge rewards for her capture -- dead or alive -- did not stop Harriet from risking her life again and again in the fight for liberty as the nation spiraled into the Civil War. Whether running from slave hunters, advising generals, or improving condition in war hospitals, remarkable Harriet Tubman would not be satisfied until every person could experience true freedom.